Create a functional vase with this 3D puzzle. Piecing together a broken vase is no fun, but this 3D puzzle puts a playful spin on ceramic reconstruction. 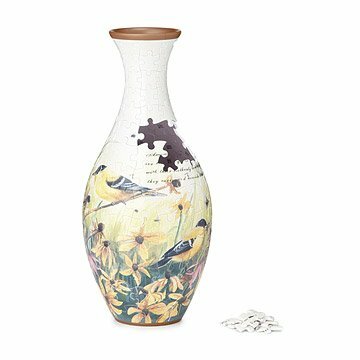 The curved plastic jigsaw puzzle pieces snap together tightly, and the included stand and water cup make the vase functional to hold water and flowers. If you get stuck, you can follow the numbers and arrows on the back of the pieces to complete your puzzling vessel. It's a great gift for puzzle lovers of all skill levels. Made in China. Something different for puzzle workers. My mother in law is so hard to shop for! This vase was so unique and beautiful! Many of the family will help assemble this unique puzzle! No cons, very awsome gift. Highly recommended! So happy I have it a shot!